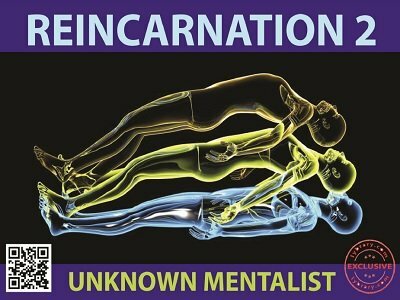 This ebook is a sequel to Reincarnation . Here the performer not only divines the name of the country in which a random participant was born in a previous life but in addition is also able to divine the exact date of birth of the participant in that past life. And the participant herself will confirm that both the place and date of birth are absolutely true. Once again jaws will drop. Undoubtedly. From the participant's perspective, the performer has to reveal the past life birth place from a possible 200 countries in the present world map. Also, the performer has to divine the exact date of birth of the participant in that life from among 365 possible dates. And once again the performer is able to pull off this extraordinary feat quite effortlessly. The methods are quite simple and classical but have never been used in this manner before. The presentation is the key here and all that you will need is included in the manuscript, including printable props. There are no sleights, no stooges, no instant stooges, no dual reality. Nothing to reset and everything is fully examinable before, during or after the performance. Suitable for close up, parlor and stage, if you can tweak the audience management part appropriately. The presentation elements of the routine are quite flexible and you make the whole routine as short or as long as it can reasonably become. You can play this as a fun routine or as a serious enigma depending on your performing persona and situation. You can also combine this with other effects like living/dead tests, name divination effects etc to make a complete set of unusual magic and mentalism. 2nd edition 2018, 29 pages. This is another GREAT and unusual effect from the UNKNOWN MENTALIST. I have already printed up a couple of copies of this effect myself and also a couple of GYAN charts out of the EBOOK for myself. My opinion is I'm going to go with what I say is a bit BIZARRE and use the following effects and watch the spectators eyes pop out. If the spectators don't believe I can walk on water after that I give up. I recommend REINCARNATION and these other effects very highly.